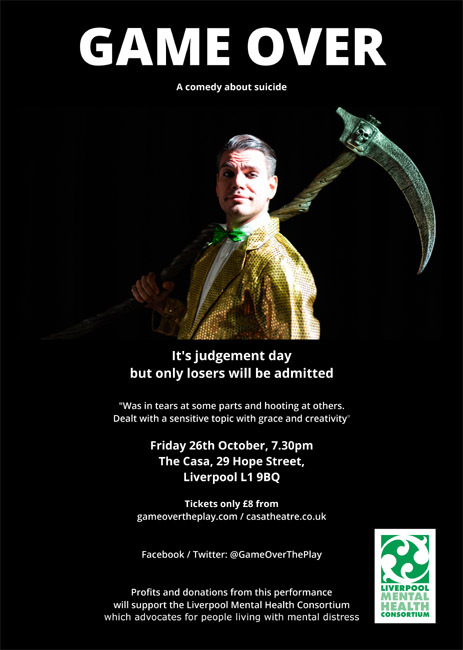 GAME OVER is a comedy musical about two men who take their own lives on the same night and compete in a game-show for the right to stay dead – It’s X-Factor meets judgement day in this unique, site-specific experience. At the start of the play we see them arrive at ‘Limbo’, a dark place populated by lost souls (the audience) and ‘Death’. Death explains that due to a clerical error, only one of them will be allowed to die – and that the other will have to go back to ‘their living hell on Earth’. To decide who dies, both characters are forced to play a series of game-show style rounds to see who had the more miserable existence, thereby showing themselves worthy of the Grim Reaper’s scythe. As the play unfolds, game-show devices are used to uncover the truth about each character’s back-story and ask them to explore the reasons for their current predicament. The play explores some issues around suicide and depression in a way that is entertaining and original, humorous and anarchic.